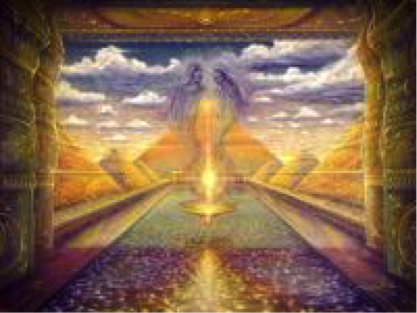 Only those who hold the peace, simplicity, and transparency of the Essential Being, can enter the bridal chamber of the Created (divine masculine) and Uncreated (divine feminine), God & Human, a union without separation or confusion. The bridal chamber is where the person, in the form of their perfect self and their spirit, are combined in the mystic marriage. The female component, the pure and virgin bride, must be kept secret. She is for the eyes of her husband only and for the children of the bridal chamber.